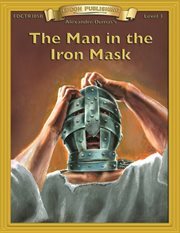 The item Alexandre Dumas' The man in the iron mask., (electronic resource) represents a specific, individual, material embodiment of a distinct intellectual or artistic creation found in Austin Public Library. Alexandre Dumas' The man in the iron mask. Deep inside the dreaded Bastille, a twenty-three-year-old prisoner called merely "Philippe" has languished for eight long, dark years. He does not know his real name or what crime he is supposed to have committed. But Aramis, one of the original Three Musketeers, has bribed his way into the cell to reveal the shocking secret that has kept Philippe locked away from the world. That carefully concealed truth could topple Louis XIV, king of France, which is exactly what Aramis is plotting to do! A daring jailbreak, a brilliant masquerade, and a terrifying fight for the throne may make Aramis betray his sacred vow, "All for one, and one for all!" trueAlexandre Dumas' The man in the iron mask. Appeal Terms of Alexandre Dumas' The man in the iron mask.